I wasn't really planning on posting this Lemon Meringue Pie so soon, but I posted this pic on Facebook and Twitter and there was such a positive reaction that I thought I had better get on with it! 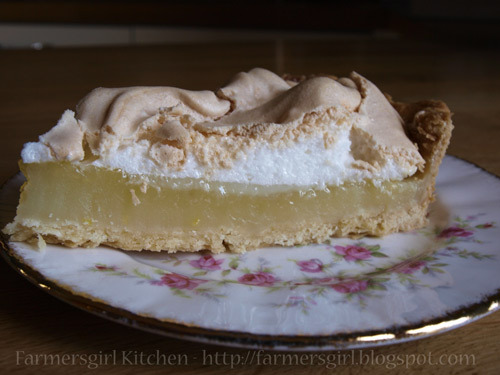 I don't often make Lemon Meringue Pie because it always seems a bit of a fiddle, blind baking the pastry, making the lemon filling and then, the easy bit, whipping up the Meringue topping. However, it is a favourite of my MIL and as it was Mother's Day, I thought I would treat her. Sift the flour into a blowl and rub in the butter until the mixture resembles fine breadcrumbs. Stir in the caster sugar, then mix to a dough with the egg yolk and a little cold water if necessary. Wrap in clingfilm and leave to rest in the fridge for 20-30 minutes. Roll out on a lightly dusted work surface and use to line a 9 inch loose-bottomoned flan tin. Bake blind, covering the base with baking paper or foil and fill with baking beans. Bake in a preheated oven at 180C for 20 minutes, remove the beans and paper and return to the oven for 5-10 minutes until lightly coloured. Grate the rind and squeeze the juice from the lemons and put in a bowl with the cornflour. Add two tbsp from the water and blend to form a paste. Boil the rest of the water and pour onto the cornflour mixture. Put the mixture into a pan and bring to the boil stirring all the time, simmer for about 3 minutes until it is thick. Remove from the heat and add the egg yolks and sugar, then return to the stove and heat through for a minute. Remove from the heat and leave to cool for a minute. Then spoon into the baked pastry case. Whisk the egg whites until they form stiff peaks, add the sugar a teaspoon at a time, whisking in well after each spoonful. Spoon over the lemon filling spreading right up to the edge of the pastry. Bake for 30 minutes until the meringue is pale golden brown. looks really lovely - like lemon curd, I wasn't a fan as a kid, but i've grown up(not that my friends would agree) and will have to try this very soon. Can't beat a great retro pudding, and this looks fabulous! Lemon Meringue pie one of my favourites particularly in the Summer. Looks wonderful! Meringue is always good in my book. This looks fab! Mmm yummy! I ~love~ lemon meringue pie! looks so good - I tried making 'apple meringue pie' last week and it was a bit of an 'epic fail' as my 10 year old son would say. 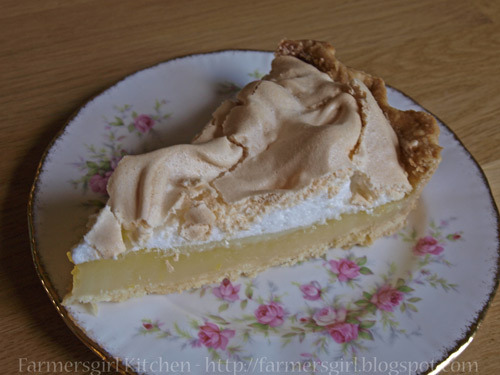 Weird recipe - most of the apple disappeared and my meringue was nowhere near as good as yours. I shall consult your blog post next time! How totally delicious. I can still remember the first lemon meringue pie I made with my mother, I must make one again soon. Yours looks so fabulous. I LOVE lemon meringue pie and yours is a wee stunner Janice!